Be free and listen to your favorite music your way. Enjoy in high quality sound - Wirelessly with LDAC. Brought to you by Sony, LDAC is the new way to make sure you can enjoy quality sound even when streaming music to your headphones or wireless speakers. Feel free to experience the difference. 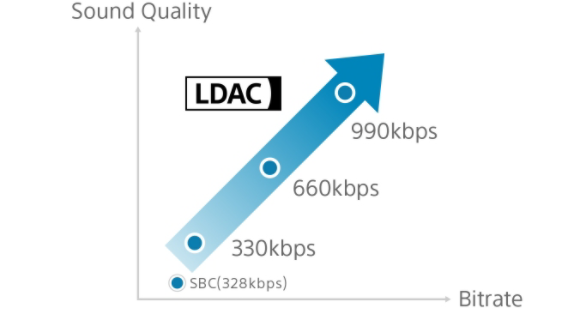 With 3x the data transmitted compared to existing wireless technology, LDAC can maintain maximum bit depth and frequency range of 96 kHz/24 bit during transmission and realizes high compression efficiency and reproduction. Experience high quality sound on devices designed for LDAC. 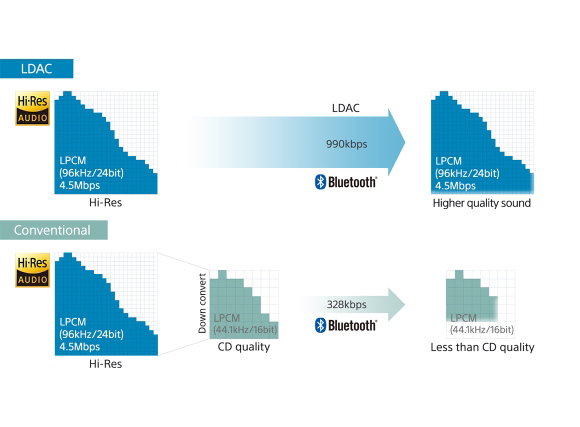 Supporting a bitrate of up to 990 kbps, LDAC enables high quality sound transmission of even conventional musical content. You can also change the bitrate to suit your wireless environment. With LDAC wireless connection, you can easily transmit music from Walkman to Wireless Speakers, Headphones, Component Audio and Sound Bars. Even outside, enjoy near high-resolution sound. Copyright © 2015 Sony Electronics Asia Pacific Pte Ltd. All rights reserved.